I’ve come late to The Treatment party. Although I was aware that Sleaze Roxx gave rave reviews to The Treatment‘s two prior albums This Might Hurt and Running With The Dogs, I never did buy any of the two releases. I did listen to a few tracks from Running With The Dogs expecting the world due to those Sleaze Roxx reviews and even though I liked the songs, they did not fully grab me to purchase the album. That and the fact that album was selling at a premium price due to being an import admittedly pushed me away. As I started listening to Generation Me, the same thing happened in that I enjoyed the songs but didn’t find anything that really grabbed me… at first. However, this time around, I started putting The Treatment‘s latest record in my regular rotation of albums that I listen to and lo and behold, I came to a startling revelation. Generation Me is an absolutely phenomenal record. There’s not one bad track on it and there are some truly standout tracks. Unlike certain records that I play where nothing stands out, the opposite occurs with Generation Me as there are many songs for which I stand up and take notice each time they play. Standout tracks include the straightforward opener “Let It Begin”, the slower and melodic “Backseat Heartbeat”, the peppy “Cry Tough” and the attitude filled “Bloodsucker” (although the latter’s chorus is a bit on the weak side). Truth be told, just about every track on Generation Me is worthy of taking notice. Just like AC/DC, any song from The Treatment is based on a memorable guitar riff and the rhythm section is air tight and provides a solid foundation. Unlike AC/DC, the guitar riffs are usually faster paced and there are some truly awesome melodies. 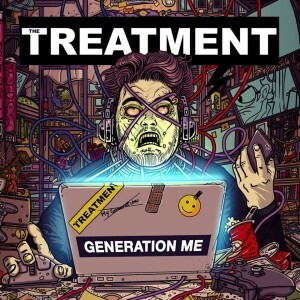 What I like about The Treatment is that they seem to walk that fine line between playing ’80s rock n’ roll without sounding dated while adopting modern rock without going overboard by straying too far from the classic sounds that a lot of us grew up on and still love today. It is admittedly hard for me to compare the contributions from The Treatment‘s new lead singer Mitchell Emms and new guitarist Tao Grey to prior members’ outputs given my lack of familiarity with the band’s first two albums but I will say that Emms has a great voice and it’s hard to imagine someone better to sing the songs on Generation Me. Although I am admittedly smitten with Generation Me overall, I do find the last two tracks to be weaker than the rest with “Better Think Again” sounding a little too much like AC/DC with the main guitar riff and “Light The Sun” feeling a bit experimental and for whatever reason reminding me for good or bad of The Beatles. Given how Generation Me has really grown on me after a few listens, there is no need to say that I have now purchased The Treatment‘s two previous albums. I am always on the lookout for the year’s next great album and there seems little to no doubt in my mind that The Treatment‘s Generation Me will find itself nestled among the Sleaze Roxx’s Top Ten Albums of 2016 at the end of this year.